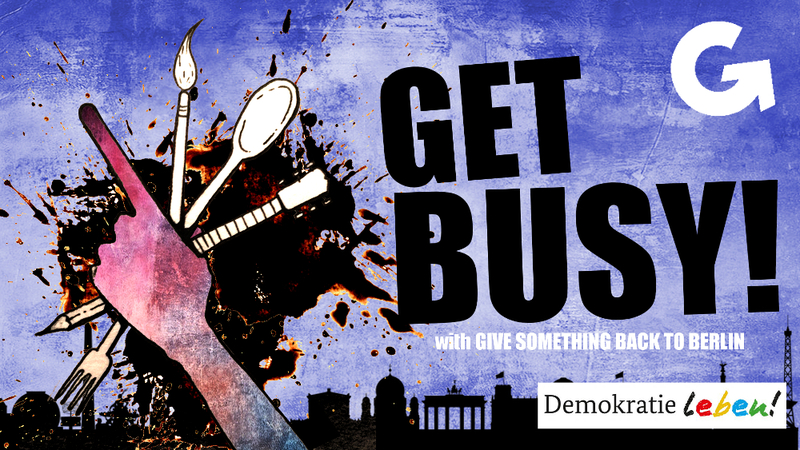 Give Something Back To Berlin » Hit the Streets with GSBTB! After a busy last Team Up in March we keep on getting busy with new projects, people and ideas! If the weather allows this time, we’ll move out from our regular hang-out spot Refugio Café to the Neukölln sidewalk to create a bit of a street-party situation so we can engage with our friends and neighbours. We invited some cool new organisations which will present volunteer work that you can dive into during the next summer months (like urban gardening and much more outdoor stuff). Of course you will also get info on how to get involved with some of GSBTB’s (more than) 20 weekly activities – such as GSBTB Open Art Shelter, GSBTB Open Kitchen, GSBTB – Open Music School, Open Sprachcafé by GSBTB and Refugio and Refugee English Conversation and Teaching in Berlin – Open English Cafe, including how to volunteer and how to participate. Maybe you want to learn how to play piano or produce electronic music? Support refugee newcomers in establishing themselves or pass on a skill you learned from back home? Or maybe you want to share that famous recipe from your hometown with others or cook for homeless people? Or maybe do you have your own ideas for doing something constructive in your community? Come and pitch your ideas and projects. Find like-minded people to start building on your own idea. Our lovely Somali community member Shukri from Refugio will cook up some delicious Somali treats to enjoy with a beer, wine or tea, meanwhile meeting new friends and building your Berlin network!